SEM is the practice of getting traffic to your business website through paid ads. We excel at marketing business products/services. We’ve been doing marketing for many years. We currently handle accounts with $10,000’s in their annual Search Engine Marketing budget with great success in sales, leads, and branding. 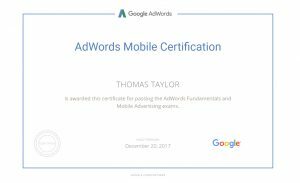 Our marketing professional, Thomas Taylor, is a Google Adwords Certified. He does Google Search Network ads, Google Display Network ads, mobile phone and app ads, and youtube. Plus, He does social media ads. Check out what we can do for you today! Using Paid-Per-Click ads, you will end up on the Search Engine Results Page with an ad that looks just like the search engine results. If you have your ads marketed correctly, you can show up at the very top of the page where you will get the most clicks. We strongly recommend using both SEO and SEM for any business! A great tool to keep an eye on consumer shopping habits online is the Google Consumer Barometer. Below is a great infographic from Gorilla Web Consulting that helps you understand the importance of Search Engine Marketing. © SEO Rank Me Now. All Rights Reserved.